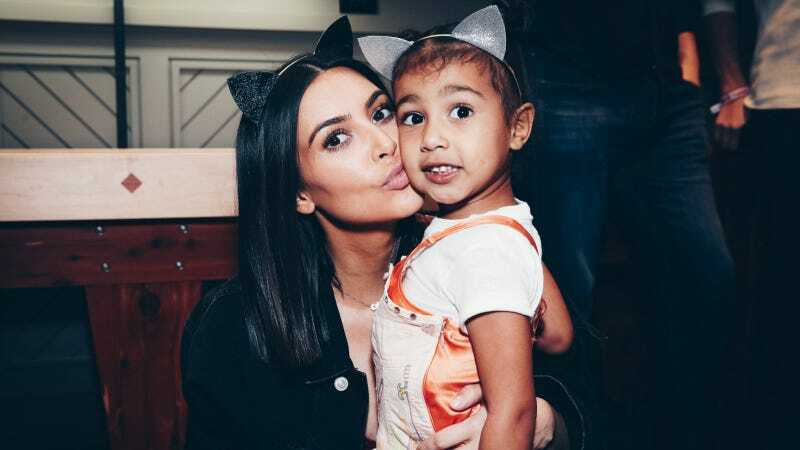 Kim and North at a Selena Gomez event, 2017. Photo via Getty Images. Now that it has arrived, some thoughts. Well, first, perhaps more of a question: Does one really need chokers for children? Photos via The Kids Supply. These sweatsuits seem pretty functional, up the wear and tear of being worn by a small human bent on destruction. However, they are $125 and $105. Camouflage hoodies for children are also available on the Walmart website, attractively priced between $13.25 and $15.28. Preventing sunburn is important. These $35 hats are therefore functional. These t-shirts are $28 and nothing special besides boasting the logo. Why bother? These dresses are 100% silk. They are beautiful, like fancy slips from a Pre-Code Hollywood film. Which, frankly, makes me uncomfortable as all hell! They will almost certainly fall victim to finger paints or grass stains or melted popsicle or just a simple rip within the first 24 hours of purchase, because—again—this is supposed to be clothing for children. They are $125 each. This is a reversible bomber jacket, made of “100% washed silk quilted filled and embroidered,” specifically with “Calabasas” in big loopy font and also a map of the area. It costs $240. Presumably even Kim and Kanye would put something like this on North for five minutes to take the picture—or to let the paparazzi take the picture—and then swap it out for some practical cotton thing that cost $15, before it gets smeared with ketchup. Half impractical items and universally overpriced, I give this collection two stars. However, I would pay good money just to see the expression on any childcare provider’s face at drop off one of these silk items.